Want to know the reason why I haven't posted much here lately? Take a look at the pictures below. Yes, that's right I'm stitching like mad when I have the time. I found this freebie for a half dollhouse alphabet and I really liked it so much I wanted to stitch it right away. As it's a rather large project, I've been busy measuring up the fabric and dividing it in pieces so I can stitch the 26 letters more easily. I'm using 14 count vintage blue aïda and DMC thread number 931. I've finished 6 letters so far and have much more to do so I'll be busy for quite some time. I'll put up more pictures of this WIP and at the moment I won't put up new freebies as I really want to finish this project first. I do like to design small charts but I do like to stitch too so I hope you'll understand I can't do both at the same time. I hope you enjoy watching this project evolve just like I like to watch it grow. PS: It's my birthday today!!! Sorry for this! But it's a good lesson for me to keep in mind to only put up pictures from my sites or computer instead of from somewhere on the internet! This is a good picture to show you what I feel like today. Last sunday my boyfriend and I got rid of my couches at home. So now I have to sit on camping chairs until next saturday when they deliver my new ones. 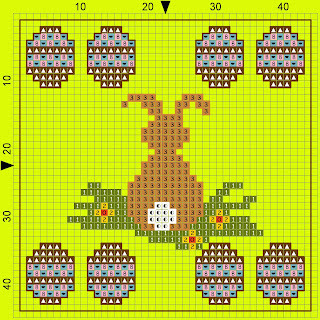 Cross stitching whilst sitting on those camping chairs is not really easy nor comfy so I'm not very happy when I'm home in the evenings. What's more, the weather is getting better so I did go for a short ride on my trike yesterday evening. I only did 4 km's as I don't want to overdo it to begin with. I haven't used my bike at all last year and my physical condition is a big ZERO!!! The result of all this is a bit similar to what the picture looks like. I hope you are feeling better and have a nice day! 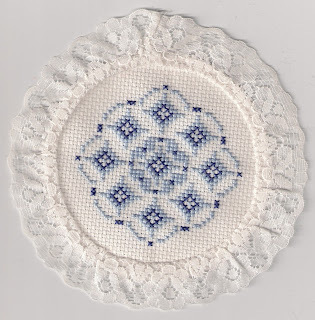 I can finally show you this doily I made a little while back. I couldn't do this earlier as I sent it as a little surprise gift to somebody who knows about this blog. I didn't want to spoil her surprise, so I had to wait before putting it on-line. She has received it in the meantime and told me she really likes it a lot! I had a hunch she was going to like it and I'm very glad she did!!! Don't ask me though where to get the doily itself, I did buy it but that was some 5 years ago and I really don't remember where it came from. Sorry. Don't you agree it's really pretty? As always, please send me pictures if you make this or/and you can always let me know what you think of it! Doesn't this bunny look cute? Especially its tail, though the picture doesn't do it justice really. I used Wisper thread from Rainbow Gallery to stitch it. It's a fine mohair yarn and it's great for a fluffy effect. 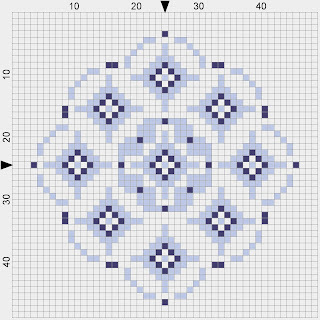 When you download the chart don't be taken aback by the backstitching you'll see. It's not correct. The only thing I did backstitch was the bunny. Everything else doesn't need it. 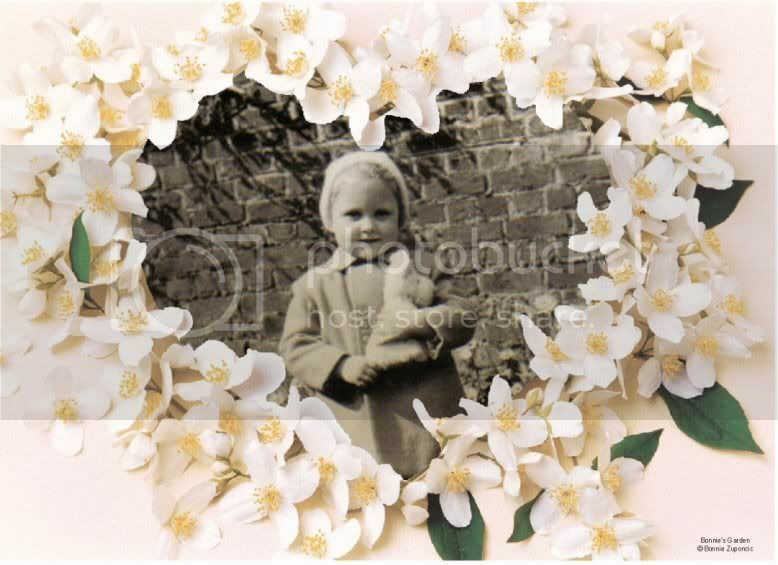 I used a nice flower button to attach it on a little rope which is made using a knitting dolly. 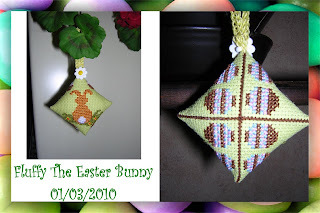 This little ornament looks cute, not only for Easter but it also makes me yearn for spring! Colours getting brighter, sun starting to shine, and we are all starting to feel a bit cheerier after the gloomy winter. Good grief, I'm almost starting to feel lyrical, feeling hoppy and all! And underneath here you can find the link for the chart and the key. I put it in a .pdf file using both colour blocks and symbols, so there shouldn't be a problem and everyone can print it, whatever kind of printer you use! Enjoy! And please send pictures if you make this ornament! CUL8R and be sure to stitch till you itch!